Everybody always raves over my simple bodysuit and skirt combos! I happily accept the praise, but I have to tell you, guys.. It is SO EASY! Most people who follow my Etsy page, Facebook group, or blog know that I can’t sew for crap. Seriously, the whole “pattern” thing is LOST on me. I have bought numerous “Easy” and “Sew Simple!” patterns and I still don’t get it. Where do I fold? What do bigger dashed lines mean? What is cross grain? Thankfully I’m so busy with digitizing and embroidery that it doesn’t really bother me that I can’t make cute frilly dresses from scratch. I have boys anyway! But along the way in my embroidery journey, I realized that it was a great benefit for me to learn how to make a VERY SIMPLE skirt to go along with an adorable embroidered/personalized bodysuit. So I started looking for VERY SIMPLE tutorials to follow, and I managed to find one that even I can’t mess up. I got my instructions here. Basically, if you can cut and sew in a straight line, you can make a simple circle skirt. 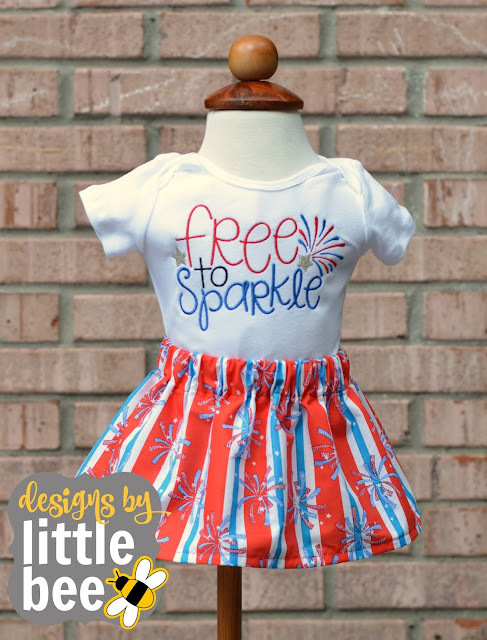 Add to it a bodysuit with an adorable design from Designs by Little Bee, and you’ve got the perfect outfit for ANY occasion. Go try it and comment with your project!